Since the girls were coming over I felt I had to whip up some dainty treats for us to nibble upon. After an afternoon perusing my mountains of cookery books I finally decided upon ginger Madeleine’s (which I forgot to photograph), sugar cookies and a gorgeous lemon cloud cake. Having never flood filled a cookie before, I knew it was something I needed to try. Rather than starting out with something complex, I decided on some simple hearts. I got the recipe for the royal icing from Not Quite Nigella after I read about her maiden voyage into flood filling (you must check out her super adorable poodle cookies). The whole process was actually a lot easier than I first though, well, once I got the hang of it. Out of the 12 cookies I made, only 8 of them were worthy of the girls. The cloud cake was something I’ve been meaning to make for the longest time. I’m utterly obsessed with lemon deserts, lemon meringue pie being my absolute favorite! This cake embodies everything a lemon meringue pie offers with the amazing addition of a fluffy sponge base. Not only does it look absolutely dreamy but when you slice it open, lemon curd comes spilling out, soaking into the cake layer, yum!! You can find the recipe on the BBC Good Food site. I wanna see a slice of that yummy cake! Sounds delightful! Your cookies are pretty sweet looking, too!~ingridBtw, I can't wait until the 2nd movie comes out! Oh my gosh, how adorable is that cookies. Feel like Valentine's day!!!!! 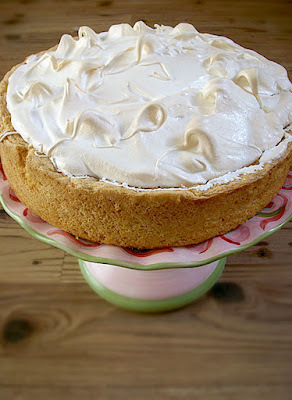 Hmmm, lemon meringue pie/cake look equally scrumptious! You would never know it was your first attempt at flooding – they are flawless! You can't go wrong with sugar cookies! But these are gorgeous! Your friends must have been so impressed! Wow, I really thought that I was a female under the age of 35 until you stated that all members of that particular population have seen that vampire movie LOL. So, I must really be over 35 or a male. haha I have no desire to see such a movie, but I do love how yummy your cookies look (even though they are pink)!! 😀 I've yet to work on flooding. I think I will try that after I work more on piping and decorating. Lovely photos! What lovely desserts you made for the girls! 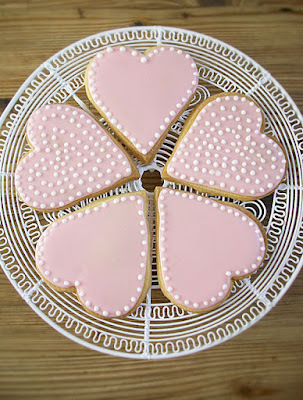 Those pink heart cookies are almost too pretty to eat. Great job! I've never flood-filled either, though it is definitely on the to-do list. Your cookies look wonderful – I'm quite impressed with your first time flood-filling skills! Good job! They look scrumptious! That sounds like a fun thing to do! One time, my girlfriends and I made pizza from scratch (I took homemade dough for the crust with me) and then watched The Waitress (lots of "pie making" going on in that movie). We had a blast.Your cookies look adorable. Love the pink colored icing. And the billowy meringue on the cake look delicious. aww they look so pretty! I just finsihed reading the whole series of the twilight saga! Really enjoyed it. The cookies and cake look great!